Above ground pools are easy to maintain if you have the hardware to go with them. The Eco Kleer is preferred by many swimming pool owners because they come in varying sizes with different filtration methods. The sand filter method is effective and preferred by pool owners who are willing to backwash the system regularly. In doing so, the sand stays in perfect condition and is able to filter the water with superiority. Waterway filters come in different sizes and offer different horsepower capacities to suit your personal pool. 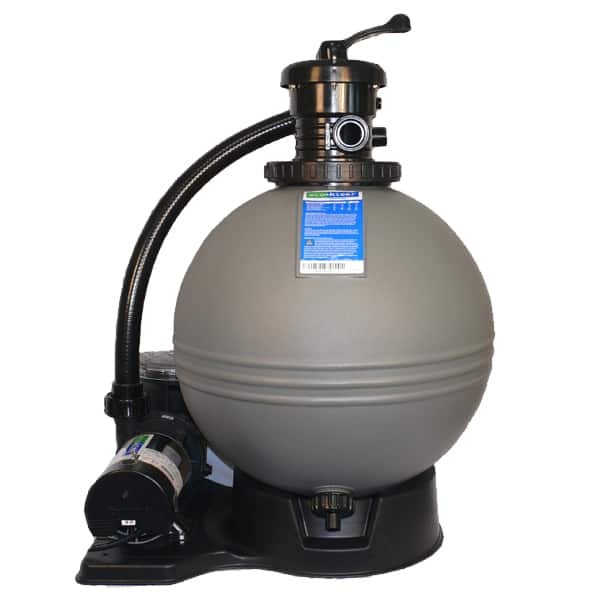 For the past thirty years, sand filters have been the most popular filters on the market, because they are effective and easy to clean. Sand filters work by spraying water over the surface of the sand, then as the water seeps through the sand, the dirt is trapped in the sand. The water is then collected by the under drain and pumped back into the pool. The dirt builds up mostly in the top 3-4 inches of the sand, and as that happens, the water flow is restricted. The pump however is still pumping at full capacity. So, since the water cannot flow as easily, pressure will begin to build-up. This will be shown in the pressure gauge. Eventually the sand becomes so encrusted with dirt, water can barely flow through. At this point it is time to backwash. Backwashing - Backwashing a sand filter is very easy. Simply unplug the pump, move the valve handle to the backwash position and plug the pump back in. This reverses the normal water flow in the system, stirring the sand up and blowing the dirty water out the backwash port. Never backwash towards the pool. A backwash or vacuum hose can be clamped on to the backwash fitting to direct the water from the pool area (it will not hurt the grass). After the filter has backwashed for 3-4 minutes, unplug the pump again, move the valve handle to the rinse position and plug the pump back in. Run the filter on rinse for 1minute. This will reseat the sand. Unplug the pump and put the valve handle position back in the filter position and plug in the pump. Waste - The waste position simply pumps the water out of pool, bypassing the filter and out the backwash / waste port. Recirculate - Recirculate simply pumps the water out of the pool without filtering it. This position is rarely used. Closed - The closed position stops water from flowing through the filter. Never use this position when the pump is on. Use this position only for cleaning the pump leaf pot. It will be necessary to plug the skimmer or water will still run in from the skimmer.